‘Osho’ is a word signifying great respect, love and gratitude. It also sounds beautiful. To the person of realization, there is nothing pure and nothing impure; there is only the real and the shadow of the real to which he has been clinging up to now. One day a monk came along, and not knowing he was speaking to the Master, asked Bokushu the way to the Master’s room. Bokushu took off his sandal and hit the monk on the head with it – the monk ran off. Then Bokushu called to him, “OSHO!” And the monk turned his head. “That’s the way to it,” Bokushu said, pointing with his finger. But once a different world existed. 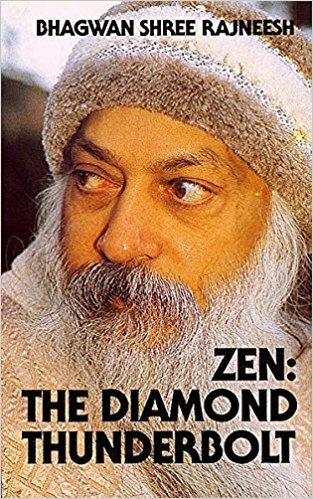 Bokushu did both things: first he hit him on the head with his sandal, and then he called him, “OSHO!” – You are also a master; who you are looking for? If you are looking for the master, this is the way. Drop your head outside; be humble, innocent. In your silence, without thought, you may find the master. Do you call us “buddhas” – as Bokushu called the monk in this story “OSHO” –To remind us of the way? Not of the way, Maneesha, but to remind you of yourself. The way is always a long journey. There is no need of any way. You can just here, now, be awake without traveling on any way. I don’t talk about the way, I talk about awakening this very moment, like lightning, like a thunderbolt. And I don’t think that if you decide to sleep a little longer, there is any harm in it. Yes, Maneesha, I call you all buddhas in the same sense as Bokushu called the monk ‘OSHO’. I love you and I respect you; whether you are awake, that is a very small matter. Just become frozen so that you can enter into yourself. This silence, OSHO, this silence, the Buddha. The deeper you go, the more OCEANIC becomes the experience. The dewdrop slips from the lotus leaf and disappears in the ocean. There is no other prayer than this tremendous silence, this peace, this ecstasy. The more you are in, the more the buddha is awake. At the very center of your being, you are the ultimate experience of being a buddha. Drink it, let it sink into every fiber and cell of your body, your mind. Carry it twenty-four hours within you – just like a silent flame, showing you the path, reminding you that you are the goal, not the way; the God, not the devotee; the sought, not the seeker. You can all come back, and for a few seconds, just sit like buddhas in your grandeur, in your grace. Blissful is the night with so many buddhas, breathing together to the same song, listening together to the same music, feeling together the very heartbeat of the universe. And this religiousness is neither Christian, nor Hindu, nor Mohammedan. It is freedom from all boundaries, it knows no limits. This contains all and gives the experience. Oh Osho. Thank you for pointing to the light within.